This compilation includes well-known classics, such as "Sleeping Beauty", "The Three Bears", and "The Ugly Duckling", along with many lesser-known stories. This collection includes stories from a variety of cultural traditions. A frightening fairy tale about a cruel man named Blue Beard who won over his wives with his riches and murdered them if they disobeyed his orders. A short fable about a boy who beat his brother because he stole his cake. 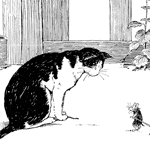 A cat bites the tail off of the mouse. The mouse is led on a merry chase attempting to bring back cream for the cat who will then return the mouse’s tail. A fairy tale about a cat that eats all who disagree with him. A folk tale about the connection between death and the afterlife, in this case, heaven. A lame and sad-looking dun horse brings good luck to a poor Indian boy. Epaminondas has a difficult time knowing how to carry his grammy’s gifts home to his mammy. Each time he tries what his mammy told him, but things keep turning out wrong for him. Avenant is sent to win over The Fair One with the Golden Locks for the king in his land. He is set to a number of tasks and because of his good nature he is able to complete them. The princess falls in love with Avenant instead of the king, but is only able to marry him after the king’s death. An old lady buys a pig. Then she cannot get the pig to jump over a fence so she can get home. She asks for help but is refused until at last she finds a cow who will give her milk. This begins chain of events which leads to getting home with the pig. A story about an abused brother that gets his reward for his kind-hearted nature through magic. An adventurous fairy tale about a boy Jack and his encounter with giants. A fairy tale about a boy Jack, known as the Giant Killer, and his adventures of escape from giants, magicians, and other horrendous monsters. The story of a gnat that was able to overcome a lion despite his small size. However, as the gnat gloats about his victory he is beaten by a spider’s web. A princess is born to a queen and king and upon her christening she is cursed by a bad fairy. Her curse is intercepted twice by two good fairies so the fate of the princess is not quite so harsh. The princess is doomed to sleep through the day to wake at night and wane and wax with the moon until kissed by a prince who knows nothing of her story. A fairy tale about a young boy named Hans that saved a town from drowning by plugging up the water in a bank with his finger. How rubies were discovered in the ocean. A village is preparing for a visit from Zeus. Everyone is too busy or too tired to extend any kindness to two beggars except Philemon and Baucis. This poor old couple has time for the strangers and are rewarded in a very unusual way for their generosity. This story is a translation of "Philemon and Baucis" from Metamorposes by the Roman poet Ovid. A fairy tale that teaches children to be tidy or they will be doomed to play with pigs in the mud. Rosamond needed new shoes, but as she window-shopped she found she desired less prudent things. She was unwise in her decisions and paid the price for it when she was unable to participate in much because she did not have the proper shoes. A short story about Raggylug, a baby rabbit, that lives with his mother and doesn’t heed her warning about hiding in the nest. After an encounter with a snake and a sudden escape, Raggylug learns his lesson. A folk tale that teaches children not to daydream, but work for their reward. This Indian legend explains the size of rabbits. A rabbit named Tavwots caught the sun in his snare and had to release him. However, he melted to a quarter of his size with the exception of his feet. A story about a sheepdog named Wylie that helped farmers in the market with her expert herding skills. The story of the three bears and a girl named Silver-hair who breaks into their house. A fairy tale in which an ugly duckling turns into a swan. Uncle Remus tells a story about Brer Bear. A fairy tale about a little bird with a broken wing and the trees that offered him shelter. The fairy tale is used to describe the nature of dying in winter. Twelve fishermen think one of them has drowned. When they count to see if everyone is there they always count eleven. The very vain Emperor in this fairy tale is tricked by a pair of thieves. FCIT, . Fairy Tales and Other Traditional Stories. Lit2Go Edition. 2012. Web. <https://etc.usf.edu/lit2go/68/fairy-tales-and-other-traditional-stories/>. April 18, 2019. FCIT, Fairy Tales and Other Traditional Stories, Li2Go edition, (2012), accessed April 18, 2019, https://etc.usf.edu/lit2go/68/fairy-tales-and-other-traditional-stories/.